In countries across Asia, thousands of bears live a life of torture on bear farms, so that their bile can be extracted and used in traditional medicine to cure ailments ranging from headaches to hemorrhoids. "It's a torture chamber, it's a hell hole for animals. As you can see, they literally can't move, they can't stand up, they can't turn around, they can just about put their paws out of the cage to feed themselves." 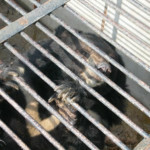 Jill was witnessing Asiatic black bears (also known as moon bears because of the yellow crescent of fur splashed on their chests) incarcerated in tiny wire cages, with rusting metal catheters implanted in their abdomens through which bile was being extracted for use in traditional medicine – medicine that, she later discovered, was completely replaceable by cheaper herbs and synthetics. Jill began her tireless work in China, resolutely building relationships and negotiating with government departments to bring an end to this cruel practice. The hard work paid off! In July 2000, Animals Asia signed a landmark agreement with the Chinese authorities to rescue 500 suffering moon bears in Sichuan Province, to work towards the end of bear farming in China and to promote the herbal alternatives to bear bile. This historic agreement was the first accord between the Chinese Government and any outside animal welfare organisation. The China Bear Rescue starts! Since October 2000, over 400 bear farms have been closed down by the Government and over 245 bears released into the care of Animals Asia at our Moon Bear Rescue Centre in Sichuan. The bears arrive in the most shocking condition – bone-thin, desperately ill and terrified, but with tender loving care and intensive veterinary attention, the vast majority of them recover. The rehabilitation of the bears takes many months. Sadly, they cannot be released into the wild, as many are defenceless and disabled, bred in captivity or snared in the wild as cubs and so don't have the necessary survival skills. Thus Animals Asia has built a permanent sanctuary, in the midst of a beautiful bamboo forest where these bears can live their lives free of pain and fear. The sanctuary and its accompanying Education Village are keystones to our work of change through education. Already our China Bear Rescue is advancing the concept of animal welfare within China on a grand scale.